After the depths of last November, there's a way the USA can qualify for the World Cup as soon as Sept. 5. Here's what else to expect in the upcoming qualifiers and Bruce Arena's roster selection. The rising stakes haven’t complicated Bruce Arena’s job. If anything, the selection process resulting in a World Cup qualifying roster scheduled to be unveiled Sunday is the most simple and clear-cut the USA manager has faced in months. The CONCACAF Gold Cup was complicated. It was a three-week tournament during which Arena wanted to balance winning with player evaluation, all while swapping out a quarter of his team. The preceding qualifiers were complicated. He essentially had to sketch out two starting lineups to negotiate games in Denver and Mexico City played only three days apart. This time, it’s straightforward. There’s a game against Costa Rica on Sept. 1 at Red Bull Arena and then another versus Honduras in San Pedro Sula four days later. The opponents are familiar and there’s time for rest and recovery. And the mission is crystal clear. Arena simply has to name a team that’ll get the job done and after eight months and 14 games at the helm, he has a pretty good idea of who’s on that team. Don’t expect to be surprised when it’s announced on Sunday. 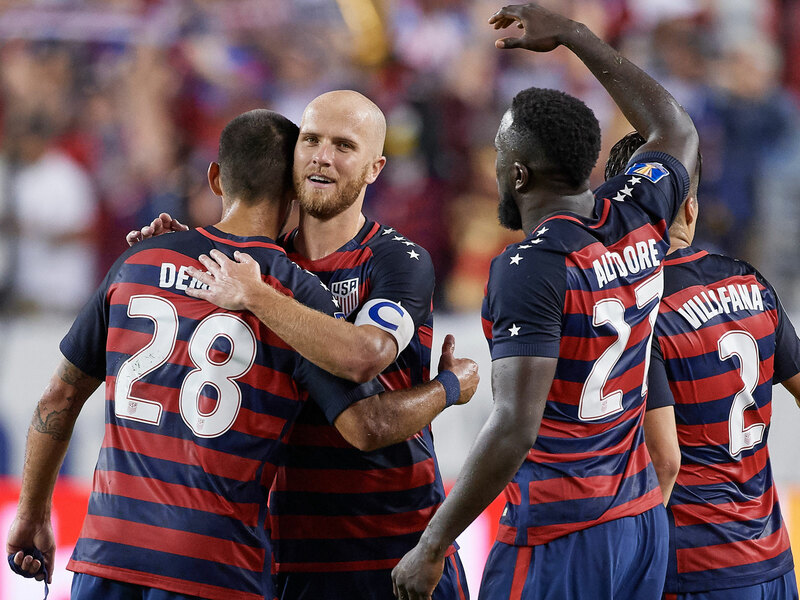 The Americans have clawed their way out of the two-game hole they fell into under former coach Jurgen Klinsmann and now sit third in the CONCACAF Hexagonal at 2-2-2. They’re almost certainly not going to catch 4-0-2 Mexico and aren’t likely going to be passed by last-place Trinidad & Tobago (1-5-0). Spots 2 through 5, however, are up for grabs, meaning the USA’s World Cup fate remains up in the air. There’s an unlikely best-case scenario that would see the Americans through to Russia, thus completing the remarkable reversal under Arena. Victories over Costa Rica (3-1-2) and Honduras (1-3-2)—and the USA has won in San Pedro Sula before—would lift them to 14 points. Then T&T would have to recapture some of its 2005 form, drawing (but not beating) Honduras and winning in Panama City. That would send the USA to the World Cup, with more than six points separating the Americans and the final three places in the CONCACAF table and two games to go. But the Soca Warriors have been didn’t-even-make-the-Gold-Cup bad, so expecting them to come through probably isn’t smart. And for the Americans, four points remains a more realistic target. If that occurs, the USA will be on 12. But with Mexico not guaranteed a good result in Costa Rica and with Honduras a decent bet to win in Port-of-Spain, the standings likely will be bunched heading into the final two matches. More likely than not, the outcomes against Costa Rica and Honduras will define the margin for error in October’s qualifying finales. Of course, Brad Guzan pays attention to his teammates’ fortune, or lack thereof, as camp approaches. But there’s a difference between monitoring and stressing. If Arena does have a selection headache, either this weekend or next Friday in New Jersey, it’ll be along the back four. John Brooks is out with a thigh injury and DeAndre Yedlin (hamstring) is unlikely to play after just returning to training at Newcastle United. That’s two potential starters, out. But there’s depth. Graham Zusi and Eric Lichaj both had good moments at the Gold Cup (the former seems like a likely starter against Costa Rica) and Matt Besler has plenty of experience partnering with Geoff Cameron in central defense, although they haven’t been paired during the Hex. Left back Jorge Villafaña finally has returned to action with Santos Laguna and Omar Gonzalez was back on Pachuca’s game-day roster this week, although he hasn’t played since August 9. Tim Ream is an experienced reserve option in the middle if Gonzalez isn’t ready. And as much as Arena has preferred to deploy Fabian Johnson in midfield, the manager has more options up there and may decide to pull the Mönchengladbach man back if he’s ready to go. Johnson missed some time with back trouble but reportedly was ready to resume full training this week. He’s started just two internationals under Arena, both in midfield. In other words, Arena has options, including DaMarcus Beasley if left back becomes an issue. “Once we get into camp, you see who's healthy. But people pick up injuries in camp, too. You just get on with it,” Guzan said, adding that the players are comfortable with the structure and options in place. They know what to expect, even in the face of the unexpected. In addition to injuries, Arena will have to plan for potential suspensions. The yellow card accumulation rule in World Cup qualifying is idiotic: get two yellow cards six games or six months apart, and you’re suspended. But it’s the rule, and the USA has several key players whose next late tackle or celebratory shirt removal could cost them. Among the Americans carrying a yellow card are Besler, Cameron, Michael Bradley, Alejandro Bedoya and Jozy Altidore. Considering the state of the squad, Bradley and Cameron are likely the least replaceable. But Arena will have to ponder the possibility. Paul Arriola is a smart, skillful player who did well enough at the Gold Cup to keep his place once Arena’s knockout-round reinforcements arrived. Jordan Morris showed that he can still be a difference maker in key moments even when facing a difficult game or a rough run of form. Justin Morrow held his own at left back after a long international absence. Kellyn Acosta has potential but isn’t yet a national team starter, while Dax McCarty can help seal off a game or add some conservative cover in midfield under the right circumstances. Bedoya remains a versatile asset. Those were nice things to leave the tournament with, although none represents the sort of shocker that will alter Arena’s thinking over the next couple of weeks. If anything, the Gold Cup simply cemented what we already knew. Bradley, Altidore and Clint Dempsey–who will stand alone as the USA's all-time goal king with his next international score–are indispensable. Their arrival won a sixth title for the Americans. Darlington Nagbe is an excellent soccer player, and although he isn’t guaranteed to have a consistent, 90-minute impact, he’s someone who must be on the roster and very well could be in the starting 11. Nagbe still hasn’t hit his ceiling. Tim Howard and Guzan are the clear Nos. 1 and 2 in goal. And the USA will go as far as those veteran stars and Christian Pulisic can carry it. It's likely that the league schedule-makers had plenty of ratings and attendance data to back up the decision to make this week a "Rivalry Week." Arena may wish they qualifying schedule also was consulted. Seeing key players involved in heated league derbies, especially on Sunday evening, probably isn't a national team manager's first choice a few days before a must-win qualifier. He'll be paying close attention to the Seattle Sounders-Portland Timbers and Toronto FC-Montreal Impact showdowns on Sunday. A significant chunk of the national team will be involved in one of those two matches. At least the California Clasico and Rocky Mountain Cup don't have the same international impact they once did, and Hurricane Harvey forced the postponement of Houston-Sporting KC. Zusi, Besler and Beasley will emerge from the weekend unscathed, and Arena will be hoping the rest of his vets do the same.